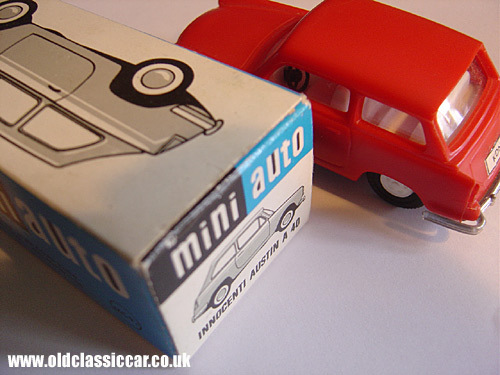 The Austin A40 Farina was built originally by the British Motor Corporation, or BMC, from 1958 through to 1967, replacing the earlier A35 with a sharp new design (albeit using the running gear from the outgoing car). This was the first of a series of cars built by BMC, but with coachwork penned by Italian styling house Pininfarina. The A40 was also built under licence in Italy, by Innocenti, where it was badged either as the Berlina (saloon) or Combinata (Countryman). In Sweden, it was called the Futura. Several Mk1 Innocenti A40s appear in the original Italian Job film, mingling in the background traffic scenes if you look carefully, as Michael Caine, Benny Hill and Co. set about nobbling their traffic management computer in Turin. 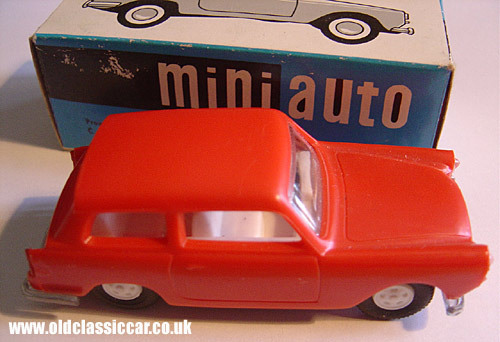 The red toy 'Mini Auto' car was made by KDN, a company based in Czechoslovakia, presumably in the 1960s. Why they chose to name it as the Italian-built Innocenti rather than the original Austin product I don't know. It is approximately 9cm long. To read more about real A40s rather than toys, take a look at this buyer's guide. The Mk1 A40 that I still own, bought by my Great Uncle in 1960, is here.